ExtraTorrent, Popular Torrent Site, Permanently Shuts Down! After the shutdown of Kickass Torrents and Torrentz.eu, it's time for the torrent community to say goodbye to the second most popular torrent site in the world, ExtraTorrent. 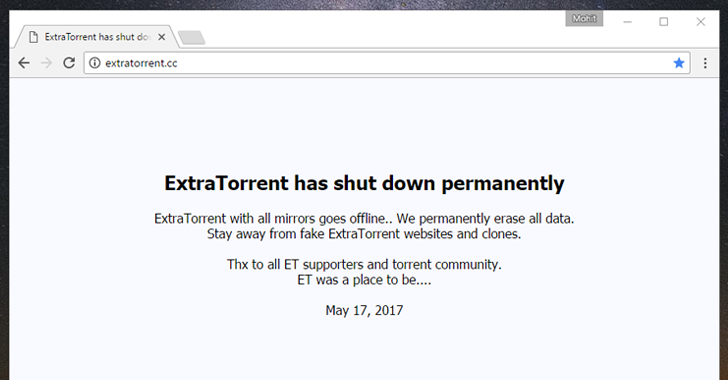 Yes, the popular torrent site ExtraTorrent has permanently shut down. So, stop searching for 'extratorrents unblock' and 'extratorrents proxy' websites. In a short but clear message on its homepage, the ExtraTorrent portal announced Wednesday that it has shut down for good, saying "farewell" to its millions of users. "ExtraTorrent has shut down permanently"
"ExtraTorrent with all mirrors goes offline.. We permanently erase all data. Stay away from fake ExtraTorrent websites and clones. 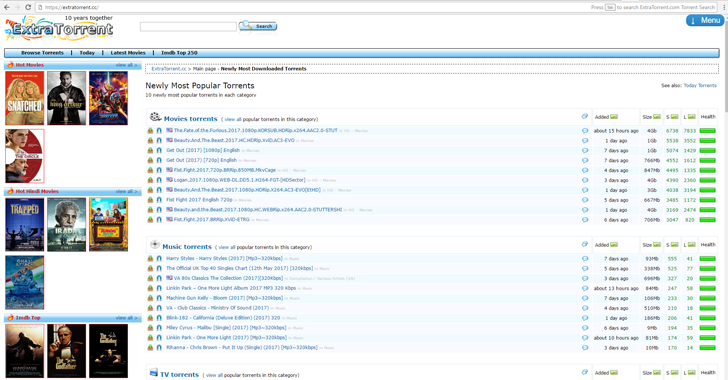 Thx to all ET supporters and torrent community. ET was a place to be...."
Launched in November 2006, ExtraTorrent became the world's second largest torrent index after The Pirate Bay in the last 2 years with millions of daily visitors and a particularly active community. Since it's common for torrent sites to suffer shutdown and domain changes, torrent users are hardly disappointed by the news as they believe if one website goes down, it’s mirror will appear shortly. This is the second active site (just before taken down) that itself said goodbye to millions of its users after Torrentz.eu, which – at the time of its closure – was the largest torrent website of its kind. TorrentFreak contacted the site's operator, SaM who confirmed it was the end of the line for them, saying "It's time we say goodbye," without giving any further details about the reason for its closure. SaM also confirmed that ExtraTorrent's release group ETRG is also gone now, but Ettv and Ethd could remain operational "if they get enough donations to sustain the expenses." Torrent websites have always been the free alternative to paying for content, but it causes billions of losses every year to the entertainment industry. Just last month, hackers leaked ten episodes of the Season 5 premiere of Netflix's "Orange Is the New Black" that has been scheduled to debut June 9 and supposed to run 13 episodes. So, you can measure the damage it caused to Netflix and Larson Studios. And just yesterday, hackers leaked the most awaited, upcoming movie, Pirates of the Caribbean: Dead Men Tell No Tales, on BitTorrent site The Pirate Bay with BluRay print after Disney refused to meet the attackers' demands.